You can store energy as potential energy by pulling a bowstring, stretching a spring, compressing a gas, or lifting a book. You can also store energy as potential energy in an electric field, and a capacitor is a device you can use to do exactly that. There is a capacitor in a portable battery-operated photoflash unit, for example.t accumulates charge relatively slowly during the reading process between flashes, building up an electric field as it does so. It holds this field and the associated energy until the energy is rapidly released to initiate the flash. Capacitors have many uses in our electronic and microelectronic age beyond serving as storehouses for potential energy. As one example, they are vital elements in the circuits with which we tune radio and television transmitters and receivers, As another example, microscopic capacitors form the memory banks of computers. These tiny devices are not as important for their stored energy as for the ON-OFF information that the presence or absence of their electric fields provides. s some of the many sizes and shapes of capacitors. 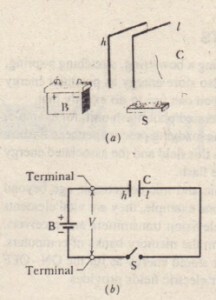 shows the basic elements of any capacitor-two isolated conductors of any shape. No matter what their geometry, flat or not, we call these conductors plates. Figure 26-3a shows a less general but more conventional arrangement, called a parallel-plate capacitor, consisting of two parallel conducting plates of area A separated by a distance d. The symbol that we use to represent a capacitor (-11-) is based on the structure of a parallel-plate capacitor but is used for capacitors of all geometries. We assume for the time being that no material medium (such as glass or plastic) is pre sent in the region between the plates. In Section 26-6, we shall remove this restriction.When a capacitor is charged, its plates have equal but opposite charges of +q and = q, However, we refer to the charge of a capacitor as being q, the absolute value of these charges on the plates. (Note that q is not the net charge on the capacitor,which is zero.) 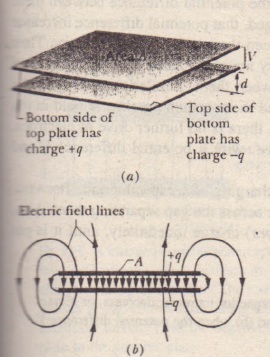 Because the plates are conductors, they are equipotential surfaces; all points on a plate are at the same electric potential. Moreover, there is a potential difference between the two plates. For historical reasons, we represent the absolute value of this potential difference with V rather than with tov as we would with previous notation. The charge q and the potential difference V for a capacitor are proportional to each other; that is. The proportionality constant C is called the capacitance of the capacitor. Its value depends only on the geometry of the plates and not on their charge or potential difference. 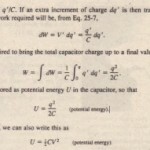 The capacitance is a measure of how much charge must be put on the. plates to produce a certain potential difference between them: The greater the capacitance, the more charge is required. The SI unit of capacitance that follows from Eq. 26-1 is the coulomb per volt. This unit occurs so often that it is given a special name, the farad (F): I farad = IF = I coulomb per volt = I C/V. (26-2)As you will see, the farad is a very large unit. Submultiples of the farad, such as the microfarad (I J.l.FL 10-6 F) and the picofarad (I pF = 10-12 F), are more convenient units in practice. One way to charge a capacitor is to place it in an electric circuit with a battery. An electric circuit is a path through which charge can flow. A barrel}’ is a device that maintains a certain potential difference between its terminals (points at which charge can enter or leave the battery) by means of internal electrochemical reactions in which electric forces can move internal charge. In Fig. 26-40, a battery B, a switch S, an uncharged capacitor C, and interconnecting wires form a circuit. The same circuit is shown in the schematic diagram ofFig. 26-4b, in which the symbols for a battery, a switch, and a capacitor represent those devices. The battery maintains potential difference V between its terminals. The terminal of higher potential is labeled + and is often called the positive terminal; the terminal of lower potential is labeled – and is often called the negative terminal. The circuit shown in and b is said to be incomplete because switch S is open; that is. it does not electrically connect the wires attached to it. When the switch is closed, electrically connecting those wires, the circuit is complete and charge can then flow through the switch and the wires. 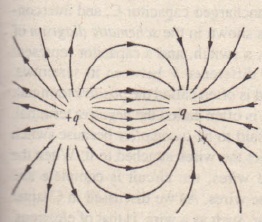 As we discussed in Chapter 22, the charge that can flow through a conductor, such as a wire, is that of electrons. When the circuit of Fig. 26-4 is completed, electrons are driven through the wires by an electric field that the battery sets up in the wires. The field drives electrons from capacitor plate h to the positive terminal of the battery; thus, plate h, losing electrons, becomes positively charged. 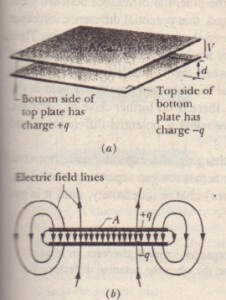 The field drives just as many electrons from the negative terminal of the battery to capacitor plate I; thus, plate I, gaining electrons, becomes negatively charged just as much as plate h, losing electrons, becomes positively charged.Initially, when the plates are uncharged, the potential difference between them is zero. 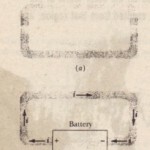 As the plates become oppositely charged, that potential difference increases until it equals the potential difference V between the terminals of the battery. Then plate hand the positive terminal of the battery are at the same potential, and there is no longer an electric field in the wire between them. Similarly, plate I and the negative terminal reach the same potential and there is then no electric field in the wire between them. Thus. with the field zero, there is no further drive of electrons.The capacitor is then said to be fully charged, with a potential difference \( and charge q that are related by Eq. 26- I.In this book we assume that during the charging of a capacitor and afterward, charge cannot pass from one plate to the other across the gap separating them. Also, we assume that a capacitor can retain (or store) charge indefinitely, until it is put into a circuit where it can be discharged. at a point or along an equipotential surface. However. in matters concerning electrical devices, V often represents a potential difference between two points or two equipotential surfaces. Equation26·1 is an example of this second use of the symbol. In Section 26·3, you will see a mixture of the two meanings of V. There and in later chapters, you need to be alert as to”the intent of this symbol. You will also be seeing, in this book and elsewhere, a variety.of phrases regarding potential difference. A potential difference or a “potential” or a “voltage” may be applied to a device. or it may be across a device. A capacitor can be charged to a potential difference,as in “a capacitor is charged to 12 V.” Also, a battery call be characterized by the potential difference across it, as in “a 12 V battery.” Always keep in mind what is meant by such phrases: There is a potential difference between two points. such as two points in a circuit or at the terminals of a device such as a Harry.